A strange cloud hangs high above the stage, set against an otherwise glorious sky in the Samuel Beckett Theatre in New York. It seems out of place, except when one realizes its poetically shadowing the lives of many of the evening’s characters in four one-act plays, all written by a once rising star of the Irish Theater. For those familiar with Teresa Deevy’s work, that imagery should come as little surprise. To Deevy, contentment, much less happiness, are rare states of the human condition. 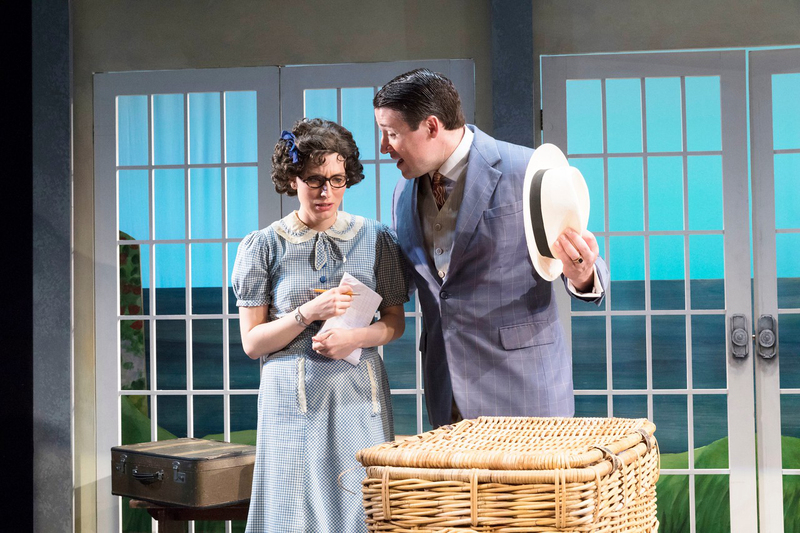 For those who don’t know the playwright, who prefer stories made up of real life, dashed with humor and wit, Deevy is a treat to discover, as audiences experienced who attended the Abbey Theater in Dublin during the early 1930s. During that time, six of her plays were produced in as many years. She was being favorably compared with Chekov and seemed bound to become the successor of Sean O’Casey. Born in Waterford in 1894, she was the youngest of 13 children, lost her father at the age of two, and went on to attend Ursuline Convent and University College, Dublin. Deevy was one of eight girls in the family, none destined to wed.
That she did exceedingly well. This kind of sentiment may have restrained Deevy’s popularity. But it earned her affection of theatre-goers who know cheery musicals and happy endings are rarely the stuff of which real life is made. And this has ben the source of Deevy’s enduring appeal. Deevy lost favor at the Abbey when bureaucrat Ernest Blythe took control of the government-sponsored Abbey in the mid-1930s. Her growing prominence hit a wall. Without a champion to revive her fortunes, Deevy proceeded to write plays that were rarely published or produced on stage. Bank’s commitment to Deevy is precisely what the Mint is all about: finding neglected work that merits attention—not because they are period pieces (which can appeal), but because of the timeless ideas they explore. And Bank and the Mint have been doing this for more than 20 years. This unique agenda has helped the Mint produce consistently compelling plays—like watching old black-and-white feature films, carried by story, character, and dialogue—not special effects, extreme plots, and big-named actors. Bank’s affection for Teresa is unabashed: “Deevy is undoubtedly the most brilliant playwright whose work I will ever have the privilege of reintroducing to the world.” This has led to three major productions between 2010 and 2013–Wife to James Whelan, Temporal Powers, and Katie Roach—along with their publication in two volumes, which include all of her complete short plays. Bank proved to be ahead of his time. Ireland has had a tradition of ignoring woman playwrights, an ignominy recently recalled when the Abbey announced its 2016 centennial program, promoted as “Waking the Nation.” Turns out ladies were given short shrift, which set in motion a competing vision, “Waking the Feminists,” which in turn demanded greater presence of women authors and actresses in the theatre’s repertoire. Currently, the Abbey is reprising Deevy’s best known play, Katie Roach. Some may question whether the backlash to the Abbey is as much about political correctness as it is good theater. And, by the way, it turns out Irish women do know something about playwriting. Dr. David Clare, assistant lecturer in drama and theatre studies at Mary Immaculate College, UL, found well more than half the 122 Irish playwrights he studied, dating back to the 18th century, were women. Over the centuries, long-standing bias limited publication of female-written plays, which in turn limited production. The title of the evening’s performance in New York, “The Suitcase Under the Bed,” informs where Bank found a treasure trove of Deevy’s old typewritten pages and handwritten notes when he visited the Deevy home in Waterford, still occupied by her grand-niece, Jacqui. Bank rarely scores an evening of short plays. This is as much a challenge for him and his cast, many of whom are performing four very different characters, as it is for the audience, who may be more used to cadence and breadth of more fully explored story-telling. These pieces are slices of life, some simple and brief, others more involved. But the four pieces collectively descend into the darker challenges of life and relationships. It would undermine the evening to describe each story in any detail. But it is worth noting three had never been performed on stage before, starting with “Strange Birth,” a simple tale of when love is innocently realized. The second piece, “In the Cellar of My Friend” is a look at misunderstood and unrequited love, with a dash of queasiness thrown in when Deevy decided a father and son should be involved with the same girl. “Holiday House” is the most chaotic and stinging of the night’s offerings, when faults in marriages begin to show with the reappearance of past loves. But the final presentation, “The King of Spain’s Daughter,” which the Abbey staged in 1935, is the most strident and darkest of the evening, as Deevy contrasts the whimsy of the heart with reality. There’s full portions of delusion here—a young, beautiful girl who wants unencumbered freedom without concern for others; a suitor and her father who believes marriage will set her straight. 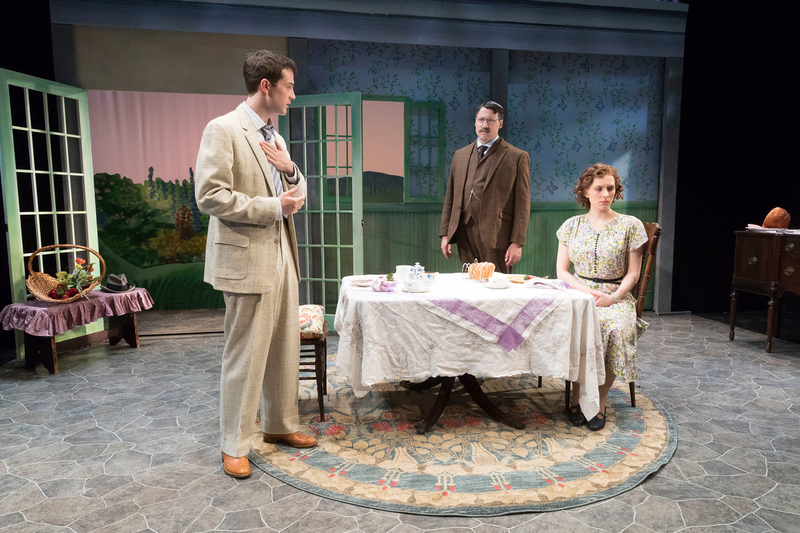 Two common traits of the four plays: characters struggling to connect with one another, and the presence of an older person–sometimes a mater or a neighbor or a gardener–who offer the clearest thinking. In acknowledging the frenzy of youth, Deevy recognizes peace and wisdom sometimes found only after having stumbled along for four or five decades. The cast’s performance is first rate, with the only minor criticism of when faux Irish accents occasionally gets twisted. 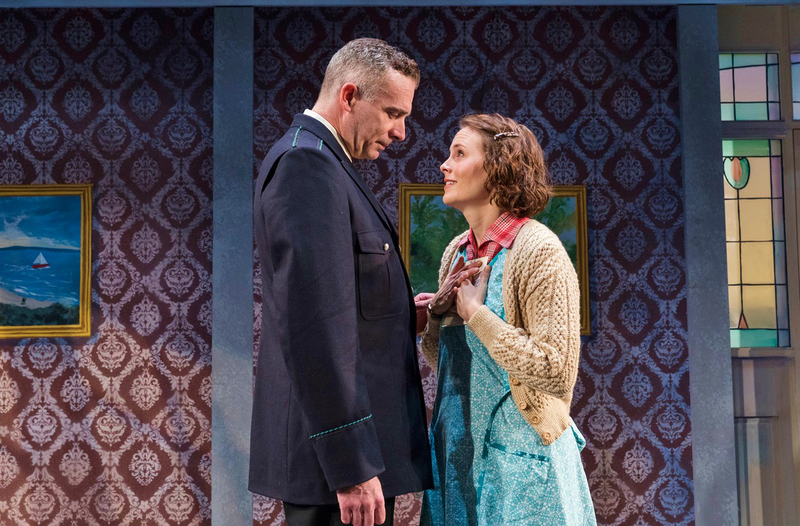 But that aside, one finds actors morphing from beautiful and genteel to mousy and mischievous, as we see in Sarah Nicole Deaver’s “Belle” and “Hetty.” And Aidan Redman anchors the evening with characters whose tone ranges from self-absorbed nouveau riche, a polite gardener, to a surprisingly passionate civil servant. The “Waking” movement in Dublin aside, don’t think Deevy’s revival is a celebration of feminism. Heightening the importance of women in drama or illuminating the disparate rolls of the sexes were simply facts of the author’s day. Deevy makes quite plain confusion and struggle afflicts both sexes, that the upper hand men enjoyed was no assurance of their own happiness. She certainly highlights women’s limited opportunities. But we find on stage decent, hard-working men as we do sympathetic women. And we find shrews in many forms, regardless of chromosomal makeup.